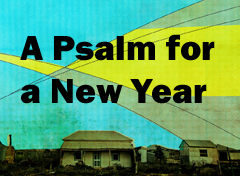 In our recent sermon “A Psalm for a New Year”, I challenged us to consider writing a Psalm for either the season before us or for all of 2015. The idea was not to be negative towards the typical New Year’s resolution, but rather to engage in the thoroughly biblical practice of lament. Goals can be good. I would never discourage goal-setting outright. However, goals are often made in response to desires for improvement or change that depend upon our own discipline and personal achievements. A lament is a different kind of response to the desire for change or improvement. A lament calls God’s character and power into action. A resolution usually call our own character and power into improvement. There’s no doubt that the Lord can guide and grow our character in a way that helps us fulfill a resolution. However, why would we NOT lament more when it’s so common in the scriptures? 1. What do I need from the Lord for this next season or year? 2. In what way does my heart need to be refocused towards Jesus? It is unbelievable and sad how often I choose to look to anyone or anything other than the Author of life! What are you looking to that has taken the place of Christ? Are your hopes set on yourself? Are your hopes set on others? Are your hopes set on your circumstances? Many of us believe if we could just change…if others would just change…if our circumstances were different, everything would be better. This is a lie! Only Jesus can transform and bring lasting change! Writing a Psalm of Lament recalibrates our heart to hope in Jesus alone. Therefore, in writing a Psalm of Lament, you’ll effectively be preaching the Gospel about Jesus to yourself as you endeavor to lay your cares and hopes at the feet of Jesus. And as follow up to writing your Psalm, share it with a friend, your spouse or your community group (if given the OK by your group leader) and invite others into the ways in which you’re placing your hopes and cares in God’s capable hands.